•	Newly listed in summer 2016! Your vacation home is centrally located in the Burgundy wine region with easy access through picturesque routes to many famous spots (7 min drive to Chateau de Couches; 15 min drive to Meursault; 22 min to Beaune or Chalon-sur-Saone; 1 hr drive to Dijon or the Morvan National Park). Many medieval castles are within 25 miles drive along scenic routes. A TGV station with trains to Paris or Lyon is within 20 min drive along the beautiful Canal du Centre. Car rentals are available at the TGV station. •	It is within a 10-min walk to the picturesque canal and lively village center where you will find bakeries, restaurants, shops, Locaboat, hair salons, a pharmacy, and a bank. There is a weekly market in the town center and nearby villages. Within 1 mile, you will find a post office, a supermarket, and a gas station in town. The famous weekend markets in Beaune and Chalon sur Soane are 20-min away. •	This much loved and lovely home offers three comfortable bedrooms and two baths perfect for up to 6 persons who enjoy country living and outdoor activities, such as boating, fishing, biking, hiking, and scenic drives. •	This spacious home (130 m2), converted from a late 1800's house with barn, is decorated with exposed original beams, an old stone fireplace, and rustique furniture, while the fully equipped kitchen, bathrooms, and dining/living room provide modern comfort. A laundry room is equipped with washer and dryer. •	A large terrace provides beautiful and relaxing views of the Chalonais hills and vineyards as well as the Cote d'Or in the North. •	The house has a courtyard with grapevine and fragrant roses and a large garage open to the backyard with flowering bushes and fruit trees. We are University Professors who enjoy traveling, gardening, and all things natural and beautiful. Living in the countryside of France with easy access to cultural activities has been a dream for us, and we hope our much-loved vacation home will bring you beautiful memories for years to come. This old stone home was a love at first sight for us. 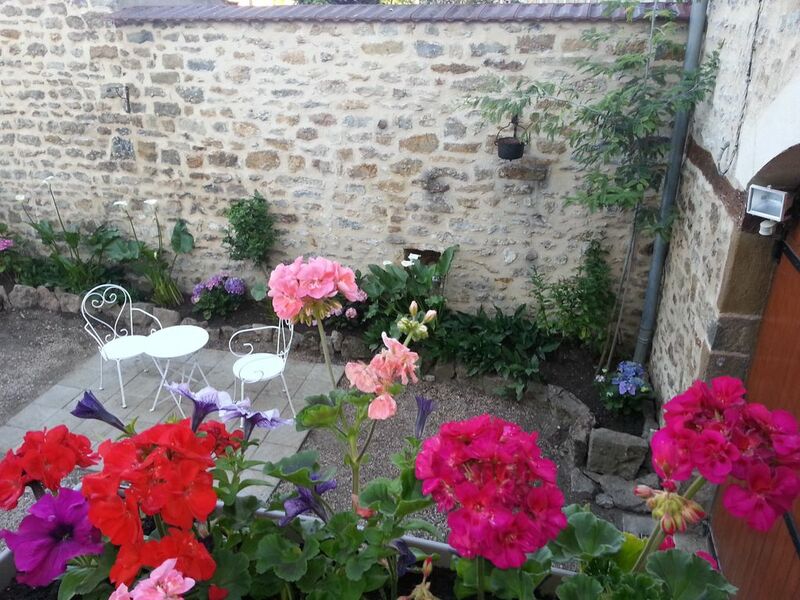 Even more irresistible for us is the beautiful and peaceful nature surrounding the area and the closeness (20 min scenic drive) to Beaune, Chalon, and the TGV station to Paris! We treasure this vacation home and we hope you will appreciate it and enjoy the stay as much as we do. This home is perfectly located for us and you who enjoy visiting medieval towns, castles, and wineries. You will immerse in authentic French country living in the lively village and appreciate the rustic historical features while enjoying modern comfort and nature in this relaxing home. There are diverse outdoor activities along the Canal du Centre such as boating, fishing, biking, hiking or scenic driving. Situated in the center of a historical hamlet, this home is within 10 min walking distance to the Canal du Centre and the town center, where you will find bakeries, restaurants, gift shops, a Locaboat agency, hairdressers, a bank with ATM, a post, and a pharmacy. A supermarket and a gas station are also located in downtown within 1 mile from the home. There are many excellent restaurants nearby. For those who wish to enjoy home cooking, you may explore the weekly markets in town and nearby villages/cities, including the famous weekend markets in Beaune and Chalon. The TGV station to Paris is approximately a 15 min drive along the beautiful Canal. One bathroom with shower and toilet is located on the first floor. Another spacious bathroom with jacuzzi bathtub/shower and toilet is located on the 2nd floor. One set of bath towels is provided for each house guest. Each bathroom is equipped with a hair dryer. Spacious and joint dining and living room (43 m2). Two leather sofas seat 5-6 persons. Panasonic TV (with Vieracast), Wi-Fi box and phone. Melita drip system with a reusable filter. My family spent 10 holiday days in those house And it was one of our best holiday. The owner was very kind and gave us many useful information about house, holiday activities, shopping and many other things available nearby. The house is really cosy, good equipped. It is excellent starting point for many holiday activities. We were interesting in cycling, wine tasting, cheese tasting, shopping markets. And there were many possibilities for that. if you are wine lover you must visit Burgundy. And this house is located near many small picturesque villages with really good wine. We enoyed during our holiday all time. Therefore I hope I will repeat our visit next year as well. We are grateful for having gracious guests like you and your family staying in our vacation home. Your experience during the stay means a lot to us as we continue to make improvement. We look forward to having you as our guests in the future. Sehr gut ausgestattet. Beaune und weitere touristische Ziele sind in kurzer Zeit zu erreichen. Sehr ruhig und ideal zum Entspannen. Thank you very much for your kind review. We hope to host you again. In absoluter Ruhe und guter Luft mit freundlichen Nachbarn kann man sich in diesem hervoragend ausgestatteten Ferienhaus bestens erholen. Die Umgebung bietet sehr viel Sehenswürdigkeiten, der kleine Ort ist mit allen Geschäften versehen, die man braucht. Wir haben den Aufenthalt sehr genossen und empfehlen die Unterkunft bedingungslos. Das Ferienhaus liegt in einer ruhigen Straße am Ortstrand. Von dem großen Balkon aus hat man einen herrlichen Blick über die angrenzenden Gärten und Wiesen. Im Obergeschoss befinden sich drei Schlafzimmer mit je einem bequemen Doppelbett. Außerdem befindet sich hier ein Badezimmer. Im Stockwerk darunter befindet sich die helle, offene Hauptwohnung mit Küche, Kaminzimmer, großzügigem Ess- und Wohnzimmer, sowie dem zweiten Badezimmer. Die Küche ist top ausgestattet - von der Mikrowelle bis zur Spülmaschine sowie alle erdenklichen Küchenutensilien sind vorhanden. Wir haben uns sehr wohl gefühlt. Vielen Dank. Wir hatten einen sehr schönen Familienaufenthalt in St Leger sur Dheune. Das Ferienhaus bietet viel Platz und ist gemütlich eingerichtet. In der Umgebung laden Felder, Wäldchen und Kanal zum Spazieren, Verweilen oder Joggen ein. Während unseres Aufenthaltes haben wir viel Zeit beim Wandern (v.a. Morvan oder Region der um Beaune/Dijon) verbracht. An den Ruhetagen zwischendurch kann man es sich zu Hause gut gehen lassen und wunderbar entspannen. Vielen Dank unsere ersten und so guten Gaeste gewesen zu sein und uns fuenf Sterne zu verleihen. Wir sind gluecklich, dass Ihr schoene Ferien verbracht haben und die vielen Moeglichkeiten, die diese Region zu bieten hat, voll ausgenuetzt haben. Wir hoffen Sie bald wiederzusehen. Alles Gute! The house is situated in a peaceful yet lively village where you will immerse in authentic French country living surrounded by friendly neighbors of all ages. Many medieval castles are within 25 miles drive along scenic routes, In addition to the nearby attractions, the home is located within an hour's drive to Dijon (North), the Morvan National Park (West), and Cluny (South). Le Creusot TGV station is a 15 min scenic drive from the home and car rentals are available at the station for those who will take TGV from Paris or Lyon.